If you are of a certain age —and who isn't?— you may remember a day when there was no such thing as one-stop-and-shop. If you wanted bread, you went to a bakery; you wanted ice, you waited for the ice-man to come to you; a pickle, you went to the pickle person. And sometimes even the pickle person came to you! (Don't tell me they never existed; I have sold pickles out of a barrel, door-to-door!) Naples now has as many gigantic superstores as anywhere else, but there are any number of books about the Naples of old that describe the professions of old. Some of these jobs no longer exist, and some do. I found these delightful drawings on the backs of a series of "Tombola" cards (a kind of Italian Bingo). The Cicerone. That was the name of the Italian profession and was, as well, used in English. The Oxford English Dictionary has the first English citation from 1726: "It surprised me to see my cicerone so well acquainted with busts and statues of all the great people of antiquity" and then adds, "...our English quotations are earlier than any given in the Italian dictionaries." (That is interesting, since the English word is Italian. Cicerone is simply the modern Italian name for the Roman orator, Cicero. Where English uses the straight Latin nominative case for most Roman names ending in 'o'—Cicero, Plato, Nero—modern Italian truncates the Latin accusative case of Ciceronem, Platonem, Neronem and winds up with Cicerone, Platone, Nerone.) Cicero, obviously, was used out of deference to his fabled learning and oratory skills. He might be pleased (or puzzled) to know that today his name means "tour guide." 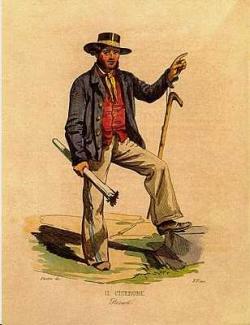 The card indicates that this is a "cicerone" from Pozzuoli. It would have been his job to show visitors the solfatara and the Roman ruins of Baia and Pozzuoli (such as the great Flavian amphitheater). Obviously, the profession still exists, especially at large tourist attractions such as Pompeii. Today, people simply say "guida"—guide, although there still exists the expression, "fare il cicerone"—to act as a tour guide. The Puppeteer. The card is labelled 'Bagatelle'. That is strange usage and seems to be a description of, rather than the name of, the profession; that is, trifling, of little import. etc. The legitimate Italian name for the profession is Burattinaio, from burattino—puppet. Strangely enough, I have seen puppet shows even in this age of television, computer games, and wall-to-wall electronic gimcrackery. The scene is usually a Sunday morning in a park where parents still take their kids out for a stroll. Maybe puppet shows are so "retro" that the novelty is entertaining (much like dial-phones and LP's! ), but the young children seem to enjoy the show. 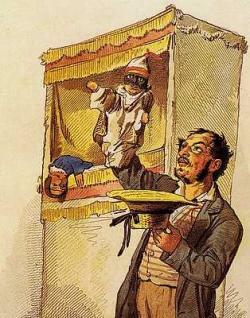 In this particular drawing, the puppet being held up looks like the Neapolitan iconic character, Pulcinella, which name is the source of the English term "Punch" in, appropriately, the "Punch and Judy" shows—puppet shows. The Zampognari. There is no one-word translation. 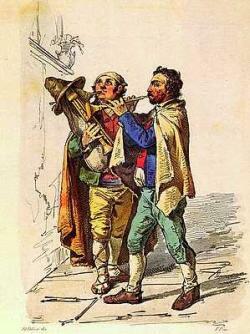 It means, "The musicians who come around at Christmas time"; one of them plays the ciaramella (a double-reed folk oboe, in the foreground in this drawing) and the other plays the Neapolitan bagpipes, called the zampogna. These musicians are still quite common at Christmas in Naples. In some cases they don't even look much different than the two in the drawing, since rustic garb is part of symbolizing the shepherds in the Gospel of Luke who received the "good tidings of great joy" and then went forth to "glorify and praise God for the things that they had heard and seen." It comes as a surprise to many to learn that the bagpipes are traditional in many places in the world outside of Scotland, including southern Italy. 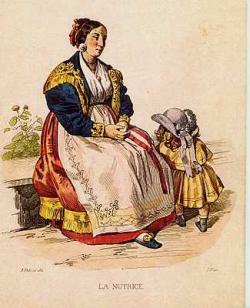 The zampognari generally play only one song, a Neapolitan dialect carol entitled Quanno Nascette Ninno (When the Child was born); it is the original minor-key version of Tu scendi dalle Stelle, the most popular of all Italian Christmas songs. Today these musicians are "buskers" (street musicians) and expect you to give them some more tangible form of "good tidings."